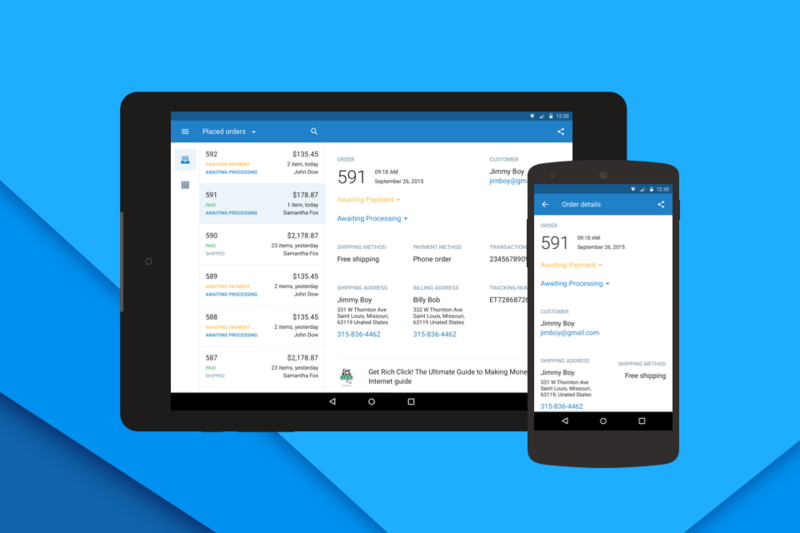 I’m excited to announce the launch of our Mobile app for Android. It’s awesome and it’s available for everyone to download it right now. Premium plan customers can take advantage of all its features right away. Just download it from Google Play and log in to your account. Those on our free plan ought to download it as well, and test-drive the features in demo mode. Let’s zoom in on what the app can do. You no longer need to print or use your computer to set up and ship an order. All of your orders, past and present, are available to view in the app. If you had the app open when you last had access to the Internet, this feature will even work offline. Check out the client’s contact data, view the address on a map, or call a customer from within the app. It’s also possible to change payment and delivery status of the customer’s order. No need to punch in data at a desktop computer anymore. 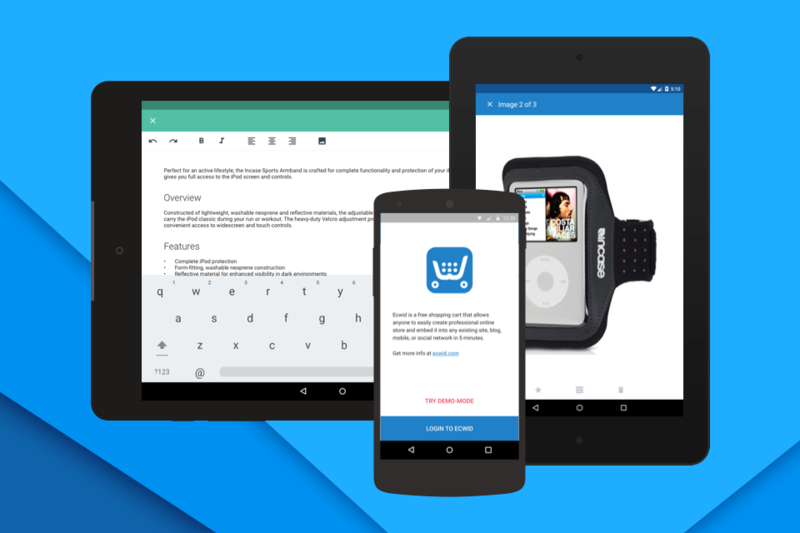 Edit product data and item descriptions from your mobile phone wherever you are. If you find a typo in a product’s name or description, you can correct it without leaving the comfort of your couch. Upload new photos, delete unnecessary ones or update product’s main image. Now you can add a product to your inventory in no time — take photos with your smartphone’s camera and add them to your product gallery. You can manage even the images of your items from your phone. It’s easy! 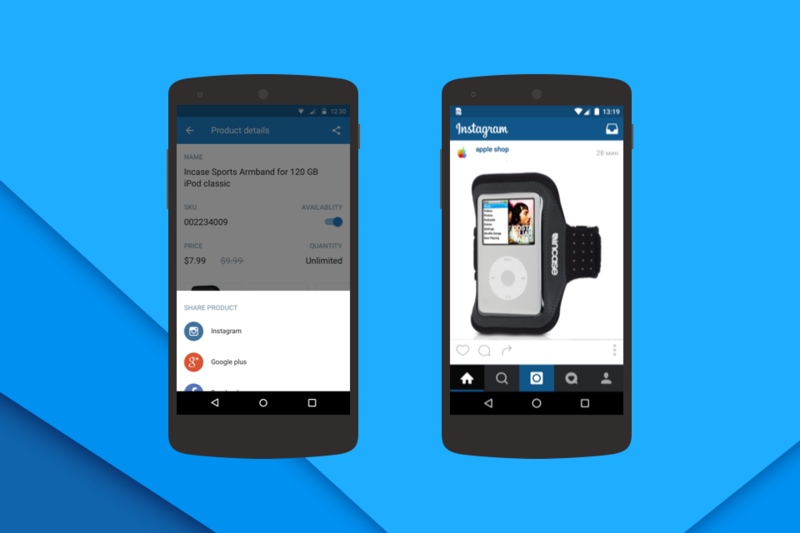 Tap the share button on the product screen and upload your product image to Instagram, along with its name, price, and description. Not too shabby, eh? This product sharing functionality works not only on Instagram, but also on Facebook and Pinterest as well. You can also send a text message or an email with the product info or link. The Ecwid app works beautifully on all Android form factors. We have optimized the app for a variety of screen sizes, and to make best use of the available screen real estate. For example, tablets with larger screens will be able to display a scrolling list of a store’s inventory alongside an individual product listing. Download the app right here, or simply search Google Play for Ecwid. We’re proud of this finished product, and would like to thank our beta testers Mark Travis, Rui Gordo, Linda Gould, Stefan Marais and many others, for providing valuable feedback throughout the development process. Take your Ecwid app for a spin on iOS and Android and realize the untapped potential in your business. We’re working hard to create the best apps for store management, so help us improve by sending your ideas to appdev@ecwid.com.